Algeria has seashores, deserts, grasslands, and forests all lying within its national borders. Tassili n'Ajjer is a mountain range in the Algerian section of the Sahara Desert. An ecological region is defined by its distinct geography, climate, flora and fauna. An ecological region is smaller than a biological region which is also smaller than an ecological zone. Algeria has a total land area of 919,590 square miles with four-fifths of desert land of the Sahara and a coastline of 1,022 miles long. Its land border is about 3,941 miles, spanning seven countries. The country is situated between Tunisia and Morocco in northern Africa. Algeria has seashores, deserts, grasslands, and forests all lying within its national borders. The Mediterranean Conifer and Mixed Forests of Algeria contain temperate coniferous forests with a mild climate. These forests are situated way up high in the country’s mountain ranges in the eastern Saharan Atlas and the eastern Tell Atlas of the country. Yew, conifer trees, oak, willow, and endemic oaks grow in the area. Habitat destruction due to deforestation has been a threat to the fauna in the area such as macaque, deer, and leopard which roam the high forests of the country. The Mediterranean Dry Woodlands and Steppe of Algeria contain Mediterranean Forests, Woodlands, and Scrub with rainy autumn months. These ecoregions can be found in the inland plateaus and mountain ranges of the Maghreb region. Brushwood and scrub dominate the vegetation. Some areas are threatened with desertification due to soil erosion. Industrial wastes and raw sewage also have become a problem threatening the wildlife biodiversity of macaques, reptiles, and avian population endemic to the region. The Mediterranean Woodlands and Forests contain Mediterranean Forests, Woodlands, and Scrub situated in the hills, mountains, and coastal plains of the country. Flora consists of Aleppo pine, oak, junipers, and shrubs. Fauna is comprised of wolves, bears, lions, stags, and leopards. Agriculture, overgrazing, and deforestation has proven to be a threat to the ecological preservation of the region. 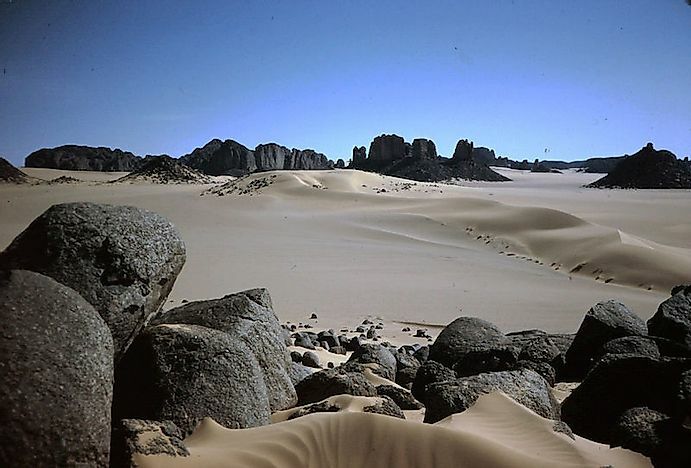 The North Saharan Steppe and Woodlands contain Deserts, and Xeric Shrublands situated on the northern edge of the Sahara with a rainy winter season. Although these rains are minimal at 250 mm received yearly. Salty soil dominates due to water evaporation while riparian habitats have water sources that provide for fauna needs. Fauna is comprised of avian and reptiles species. Overgrazing and agricultural tillage have left some areas uninhabitable. The Sahara Desert contains Deserts and Xeric Shrublands situated in the northern portion of Algeria with a hyper-arid and rainless climate. Oasis with palm trees and low vegetations are scattered among sand dunes, stone plateaus, gravel plains, salt flats, and dry valleys. Fauna occasionally seen and hunted are oryxes, bustards, and addaxes. The edges of the Sahara, however, enjoy more rainfall than the center regions. The South Saharan Steppe and Woodlands and West Saharan Montane Xeric Woodlands both regions contain Deserts and Xeric Shrublands. Rainy summer months sustain the grasses and herbs of the South Sahara region where ungulates roam. Cold and humid climate maintains wild olive trees, cypress, myrtle, and host bushes which dominate the West Saharan Montane region. The fauna here is mainly endemic reptiles and ungulates. Both areas have nomadic inhabitants. Algeria has several more ecological regions that contain their flora and fauna. Some of these ecoregions are: the Saharan Halophytics where Flooded Grasslands and Savannas dominate the landscape; Permanent Maghreb where Freshwater habitats maintain the ecological balance; Temporary Maghreb with Freshwater habitats as well; Dry Sahel also with Freshwater habitats; the Alboran Sea with Marine habitats; and the Western Mediterranean area also with a Marine habitat.